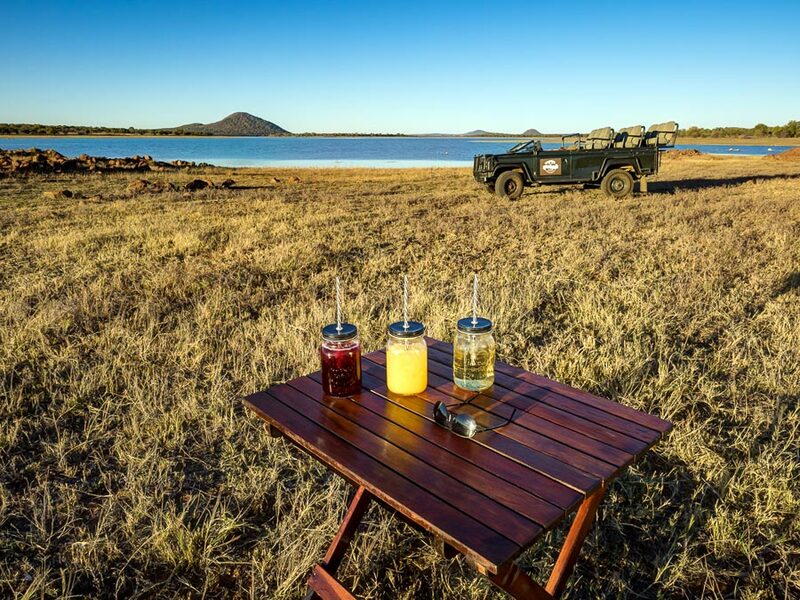 Finfoot Lake Reserve lies within the greater Pilanesberg game area and is geared specifically for larger group getaways, company retreats, and conferences. 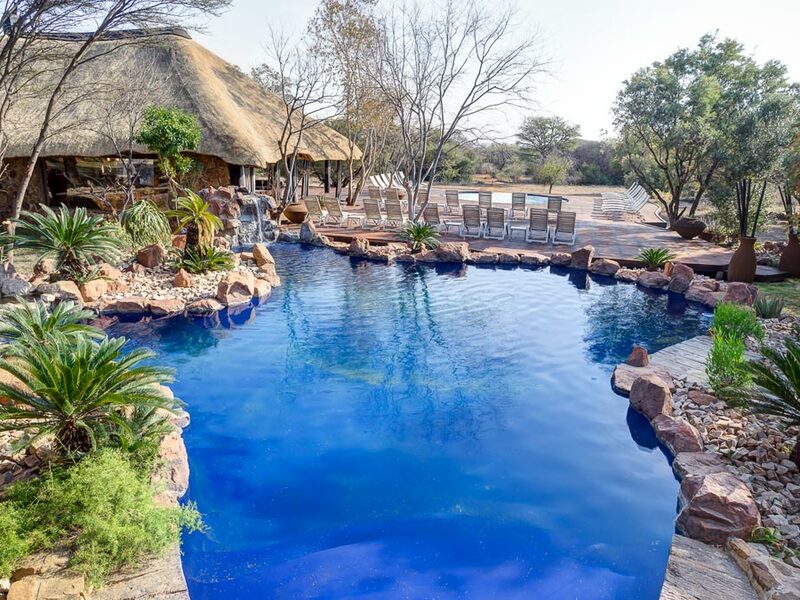 This upmarket Pilanesberg destination offers all the mod cons to make your convention or corporate function a success, including customised team building sessions. 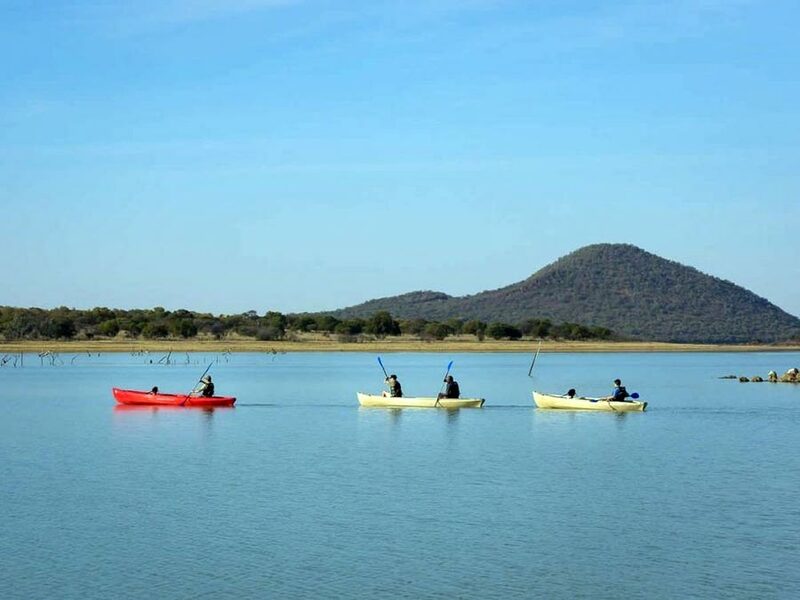 The Reserve’s setting alongside an unspoilt water frontage, ensures loads of fun water-based activities, like canoeing, fishing, and barge cruises, while the daily game drives and guided bush walks provide ample opportunity to get up close and personal with the abundant bird- and wildlife that call the Reserve home. 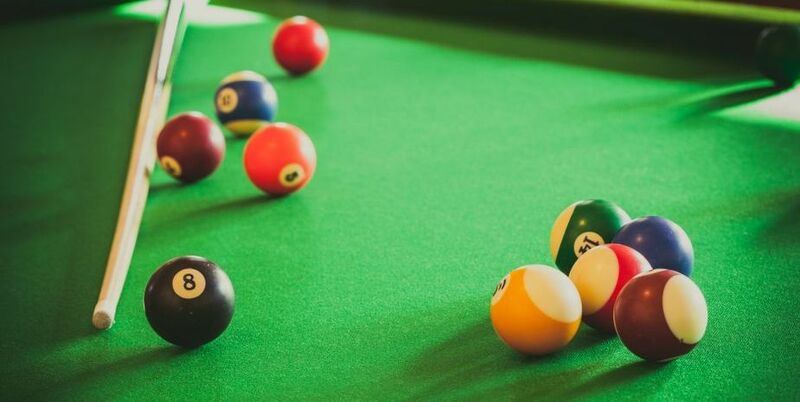 Finfoot Lake Reserve also gives visitors the chance to grab some downtime; enjoy a refreshing dip in the crystal-clear pool, unwind with a variety of treatments in the on-site spa, or engage in some friendly competition in the games room. 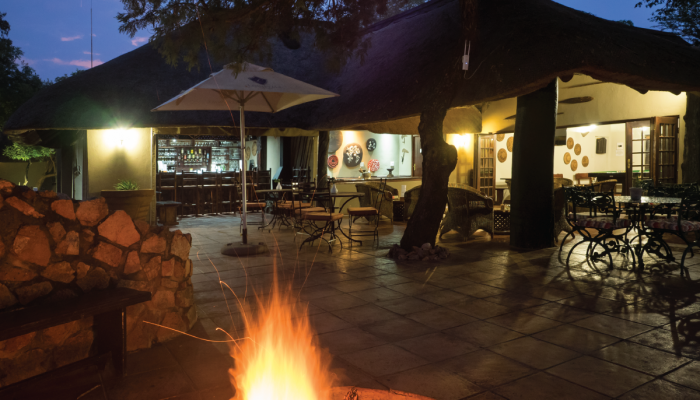 Round off another awesome day in the bushveld by tucking into a delectable home-made meal with only the starlit African skies, the crackle of a roaring fire, and the friendly banter of your group mates or fellow delegates to break the silence. 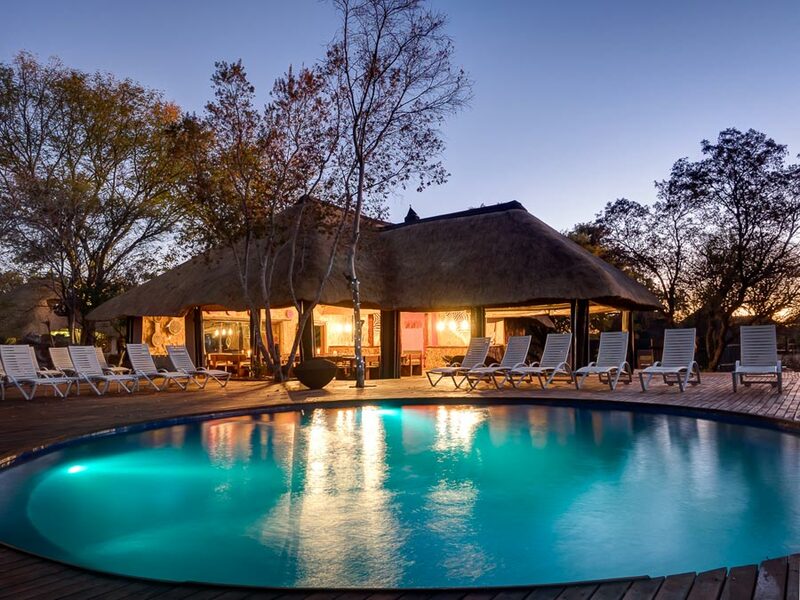 With space for up to 50 guests in its luxury thatched chalets and two upscale self-catering villa's which can accommodate up to eight and ten guests respectively, Finfoot Lake Reserve is the ideal location to host a memorable event, be it for business or pleasure. 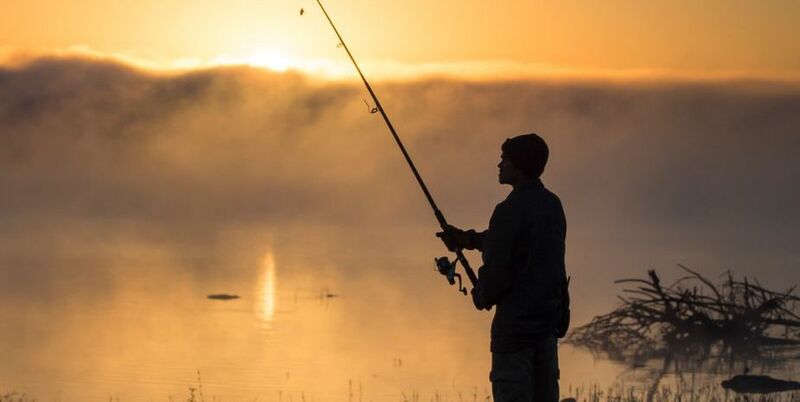 Finfoot Lake Reserve lies within the greater Pilanesberg basin (a certified malaria-free game area), approximately 30 minutes’ drive from the main entrance of the Pilanesberg National Park, and just 90 minutes’ drive from Johannesburg. 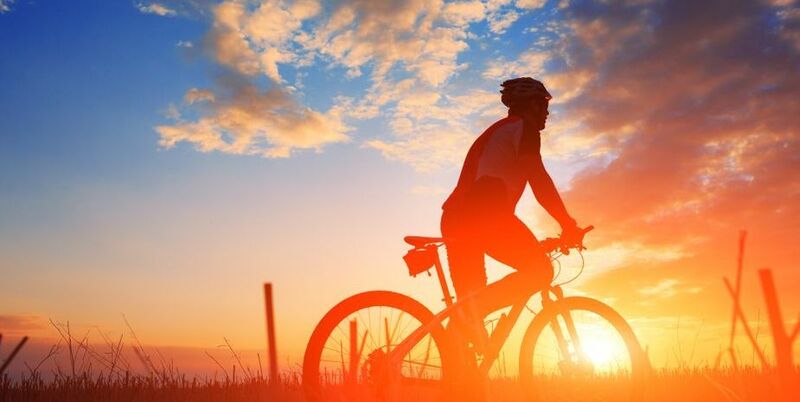 At Finfoot Lake Reserve, you can hop on one of our two-wheeled, self-balancing personal transporters. A great activity for the whole family, Segways are the coolest way to meander around the area without breaking a sweat. 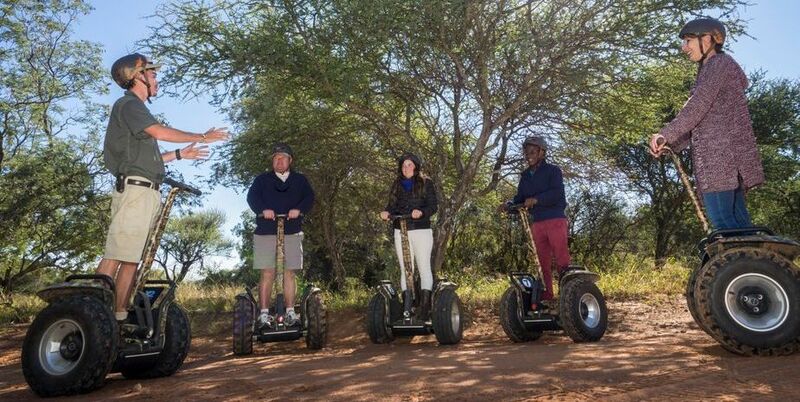 After a quick 15-minute training session to get used to it, you’ll set off on your adventure with your qualified Segway guide to enjoy a smooth ride with your best Segway smile. If you’re an avid birder (and even if you’re not), you will delight in waking up to the cheer of our happy local choristers. 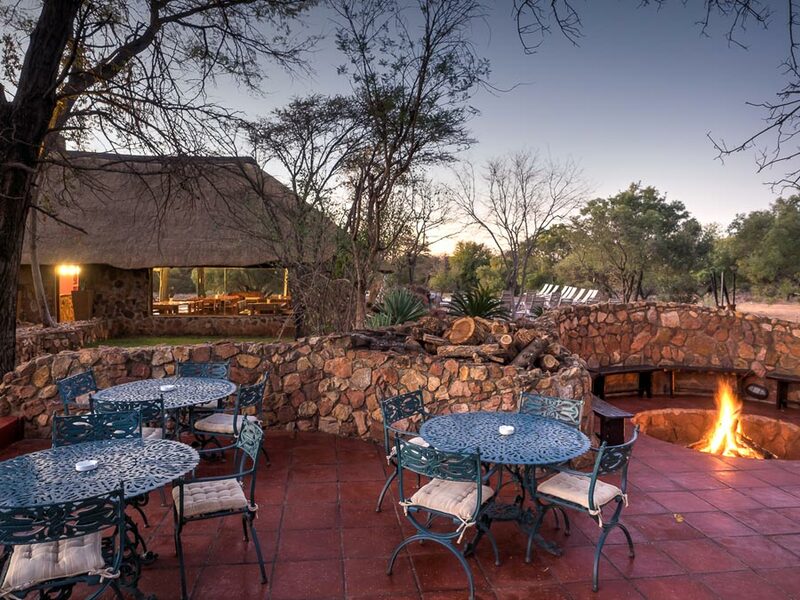 This lodge setting near Johannesburg provides a stunning backdrop for bird sightings as a myriad of species congregate around the surrounding bush and lake area during the day. 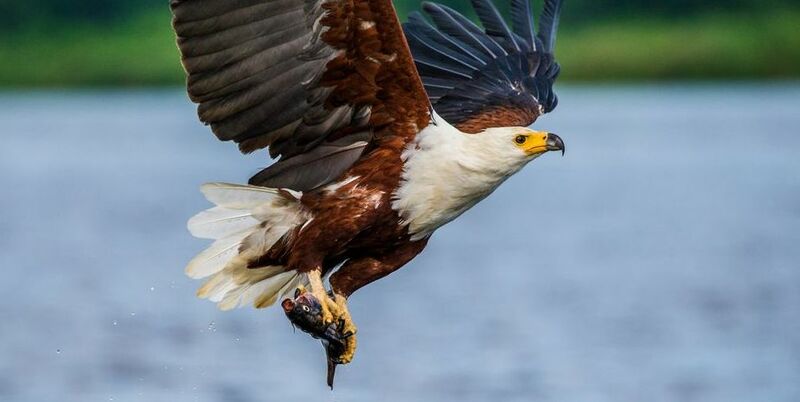 Keep your eyes peeled for African skimmers and Kingfishers and listen out for the unmistakable call of the Fish eagle that can sometimes be heard. 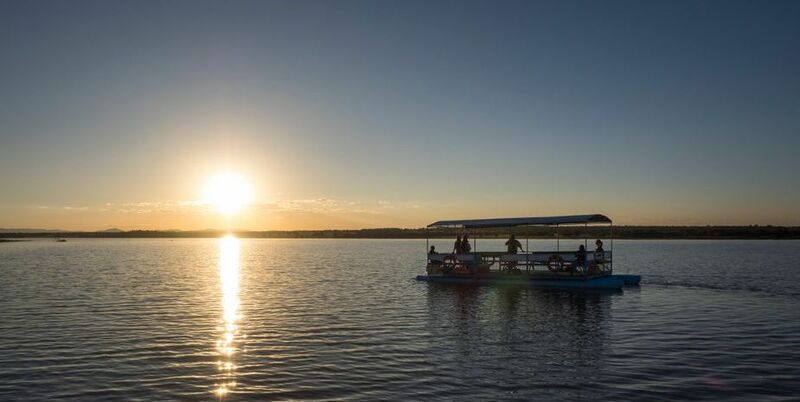 All aboard for our unforgettable sunset barge cruise. Bring your sundowner drink of choice as we cruise out over the water just before heading up to the restaurant for dinner. The scenery illuminated by the last light of the day makes for excellent photography. If you’re looking for action of the paddling variety, you’re in for a treat. 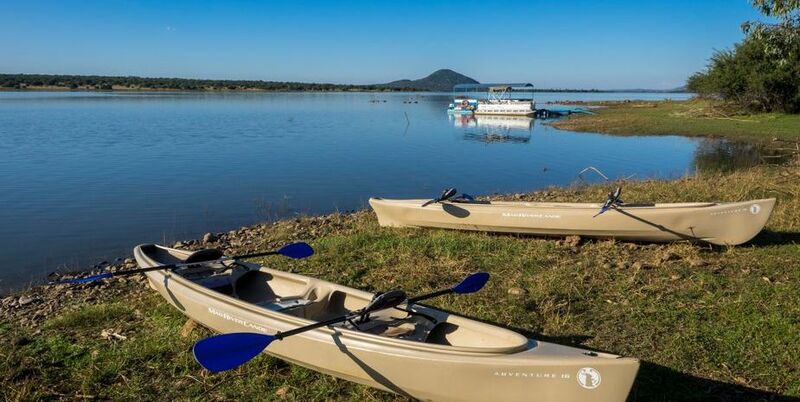 Hop into one of our canoes where you can explore the aquatic ecosystems of the lake. 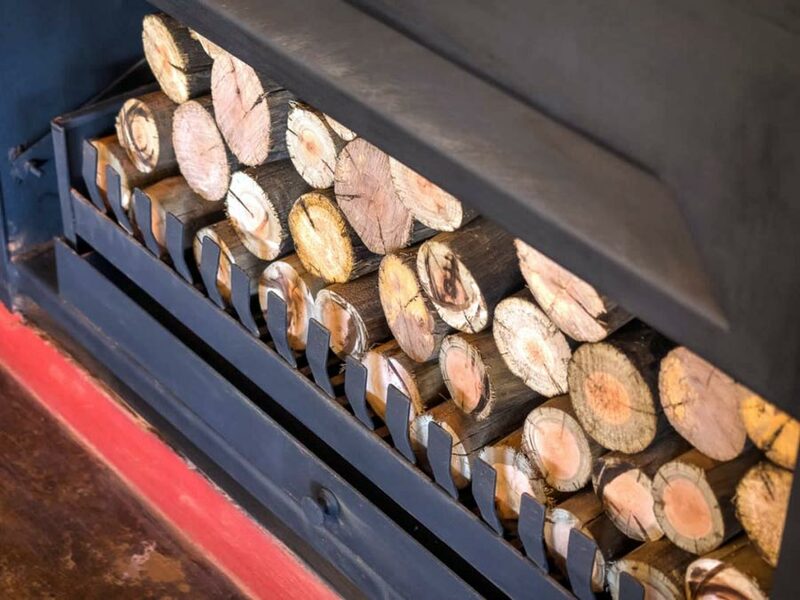 This is an easy activity for all of our guests to try during their stay. Lifejackets are also provided.. Experience the delight of a guided nature walk after breakfast, which offers an up-close perspective of the surrounding landscape. 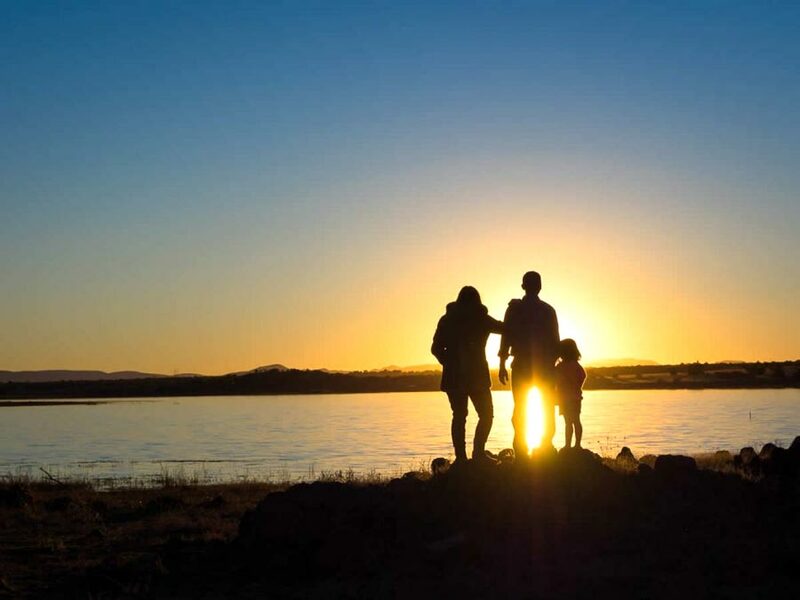 This is an easy way to stretch your legs while staying at Finfoot Lake Reserve. 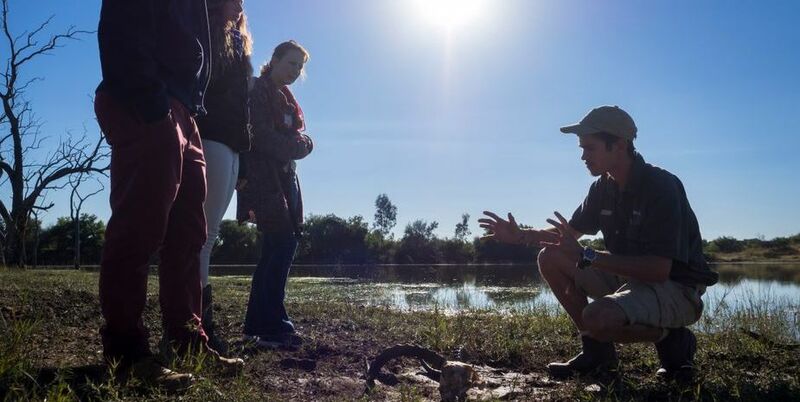 You’ll definitely learn a thing or too as our qualified walking guides teach you about the smaller creatures of the reserve as well as the medicinal uses of significant plants, herbs and trees. 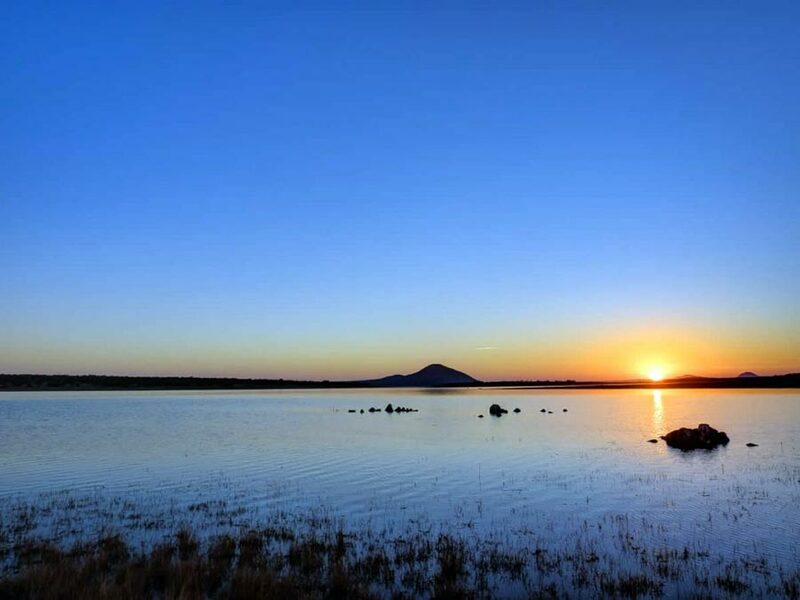 One thing you will find yourself doing at Finfoot Lake Reserve, is getting lost in the blanket of stars that will surround you each night of your stay. 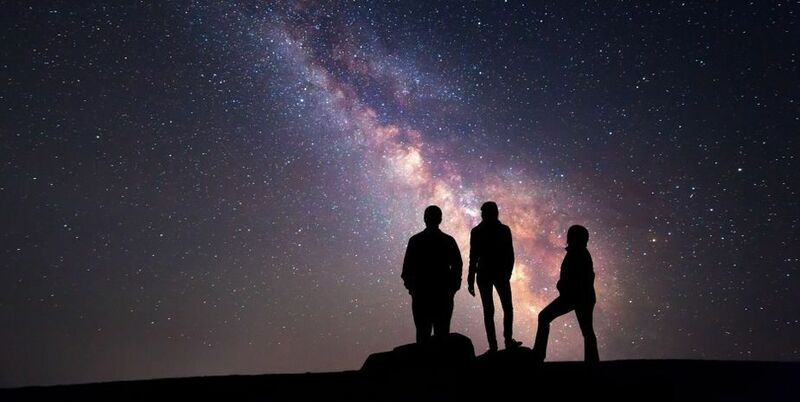 Far enough from Johannesburg’s city lights, you will truly appreciate the night sky. 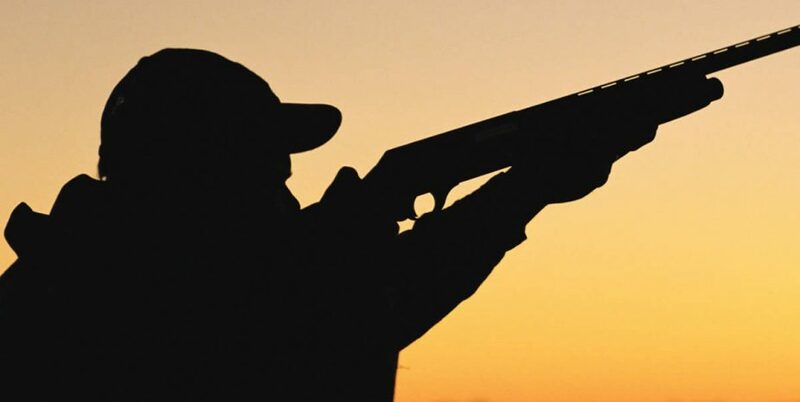 Clay pigeon shooting is a way for you to wind down a relax while shooting all the stress of the city away. 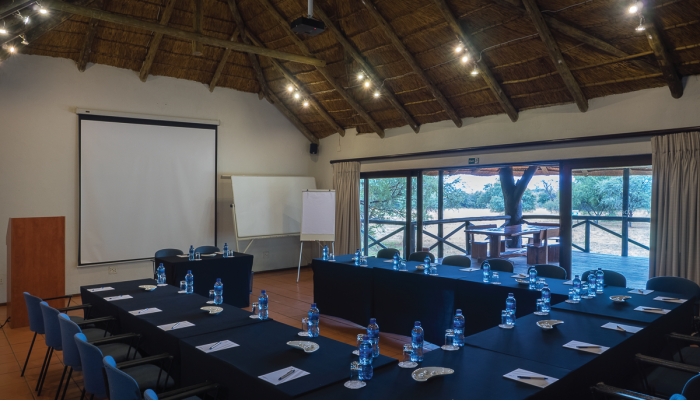 Finfoot Lake Reserve offers conferencing facilities and accommodation for delegates, as well as tailor-made teambuilding itineraries. 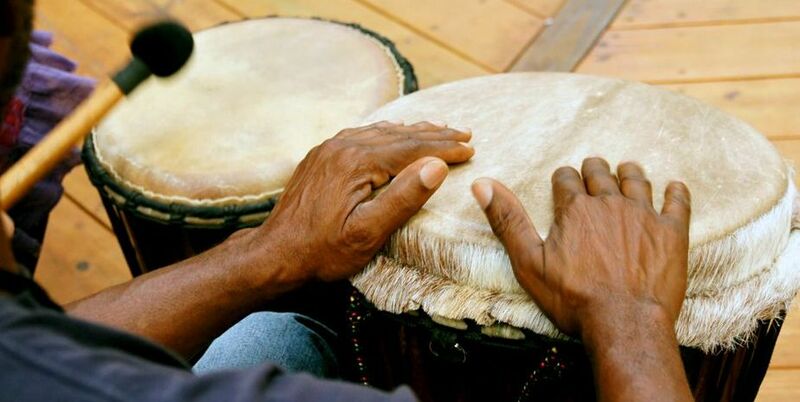 From interactive drumming, creative thinking and Amazing Race challenges, to potjiekos competitions and orienteering, our team can foster a little fun-filled competition amongst your group. 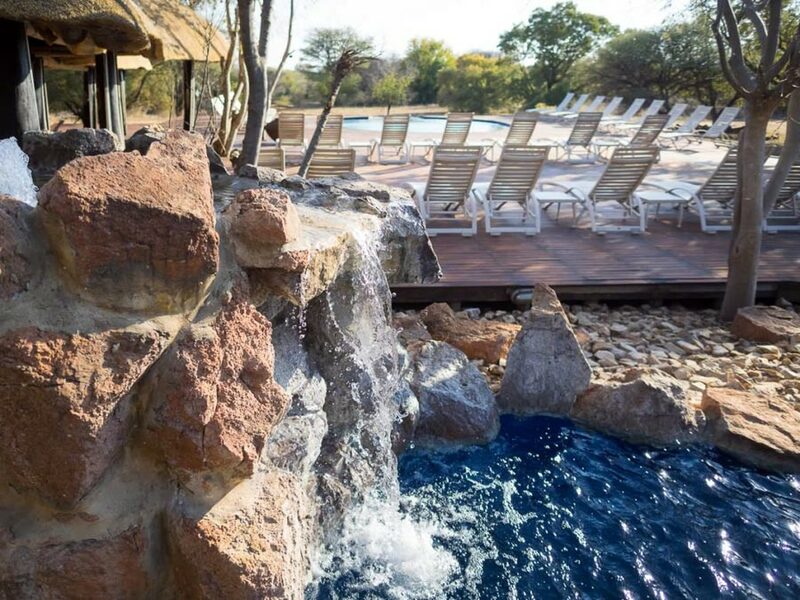 Centrally situated and equipped with a large deck our swimming pool is a must during your stay. 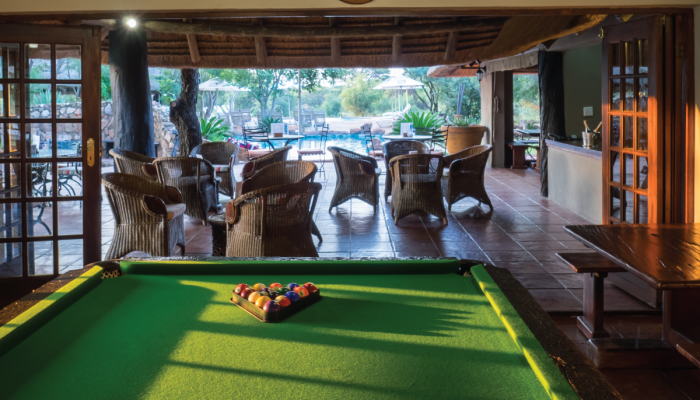 Our games room is equipped with a variety of activities ranging from pool to chess. Make time for some friendly competition. 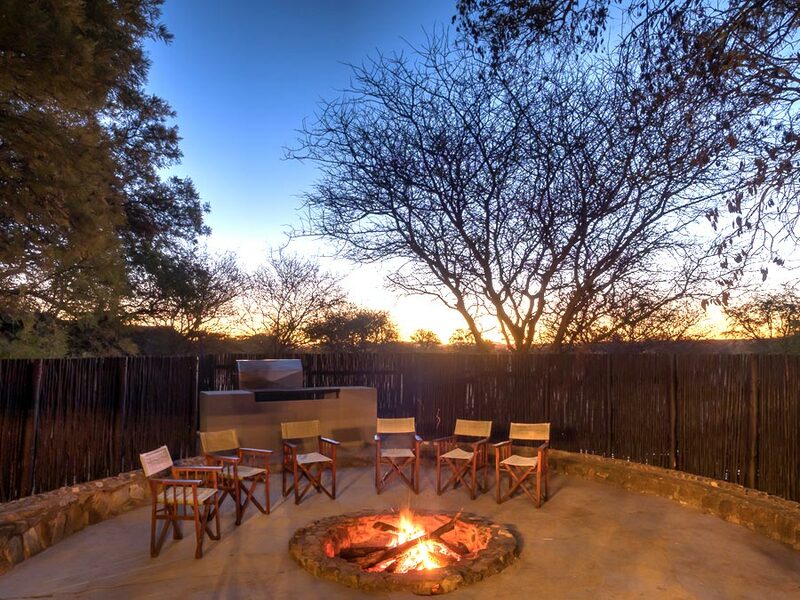 Enjoy bush braais; the magnificent stars in the night sky; and the company of everyone around you. Travel on the N4 west towards Rustenburg. Take the Sun City off ramp and turn right towards Sun City. Travel for 3km and turn right (Brown road sign FINFOOT LAKE RESERVE). Please contact Reception on 060 605 5878 to open the gate. Follow the Finfoot signs on the sand road until you reach the lodge (7.7km). 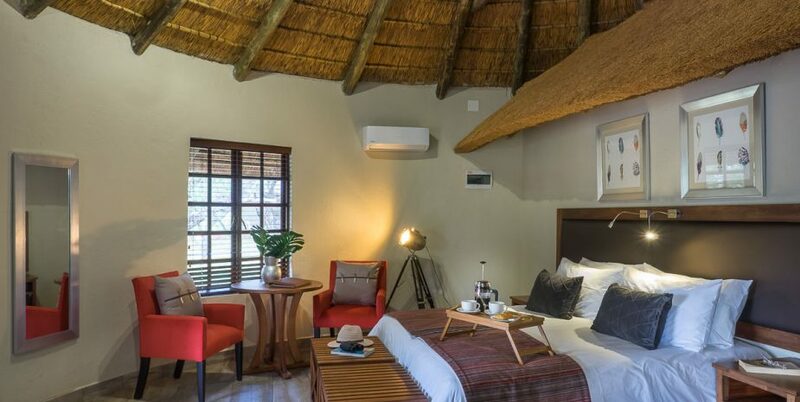 The eight 4 sleeper Bush chalets (2 beds, 1 x sleeper couch) on site have dressed thatch ceilings, earthy print fabrics and indigenous wood furniture which make for a pleasurable experience. 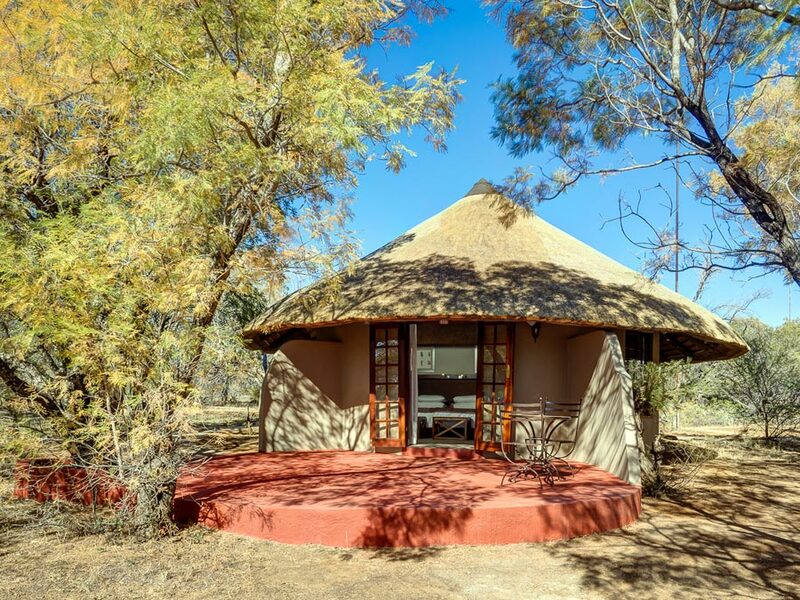 Each unit has an two en-suite bathroom with a shower and bathtub respectively. 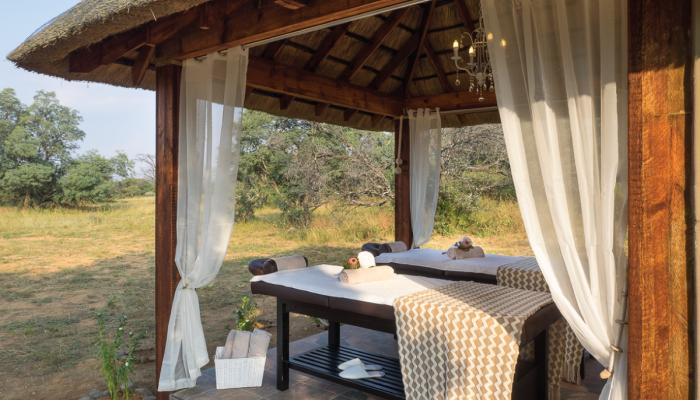 Air-conditioning provides hot or cold air depending on your requirements; or if you just want to breathe in the fresh bushveld air, just step out onto the private deck. 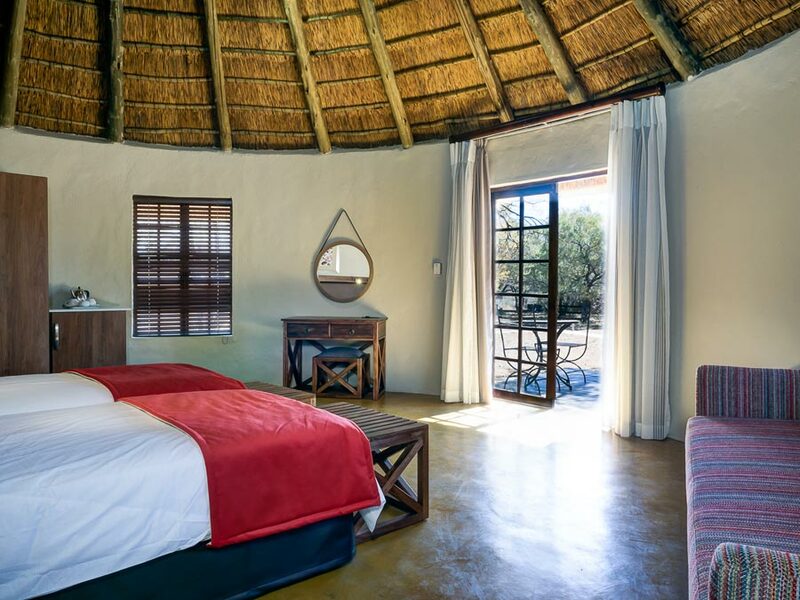 We have eighteen 2 sleeper chalets with have dressed thatch ceilings, earthy print fabrics and indigenous wood furniture which make for a pleasurable experience. Each unit has an en-suite bathroom with a shower only. 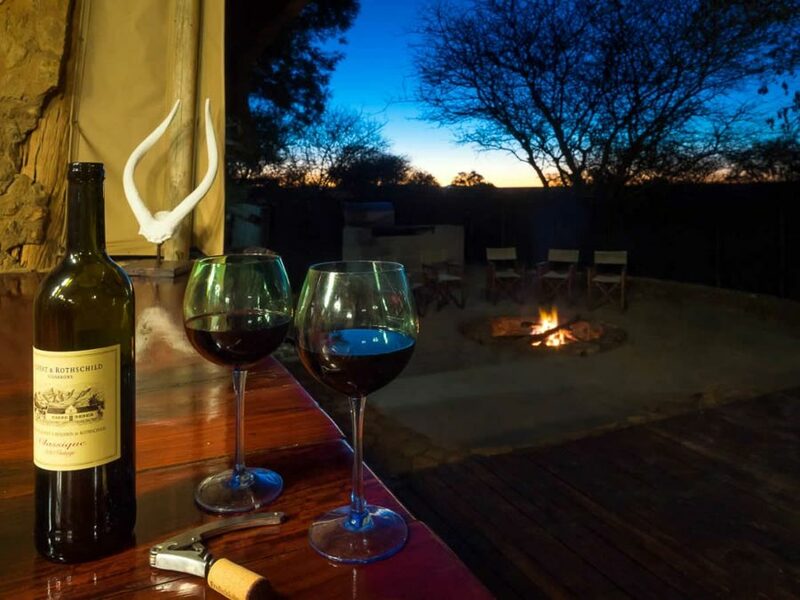 Air-conditioning provides hot or cold air depending on your requirements; or if you just want to breathe in the fresh bushveld air, just step out onto the private deck. 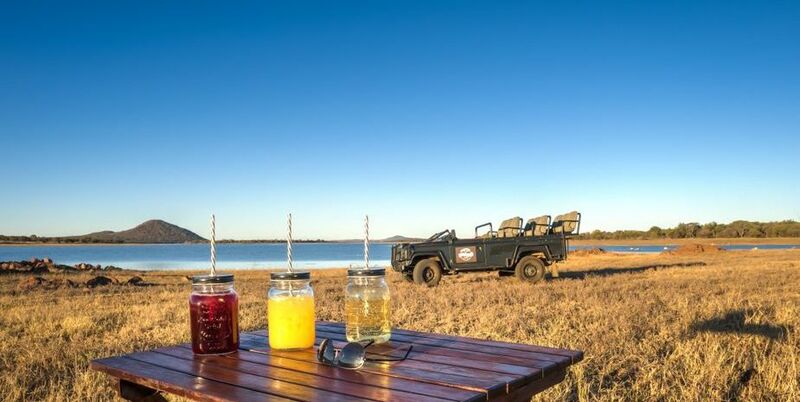 Our luxury self-catering villa is situated 200 meters from the banks of the Vaalkop Dam. 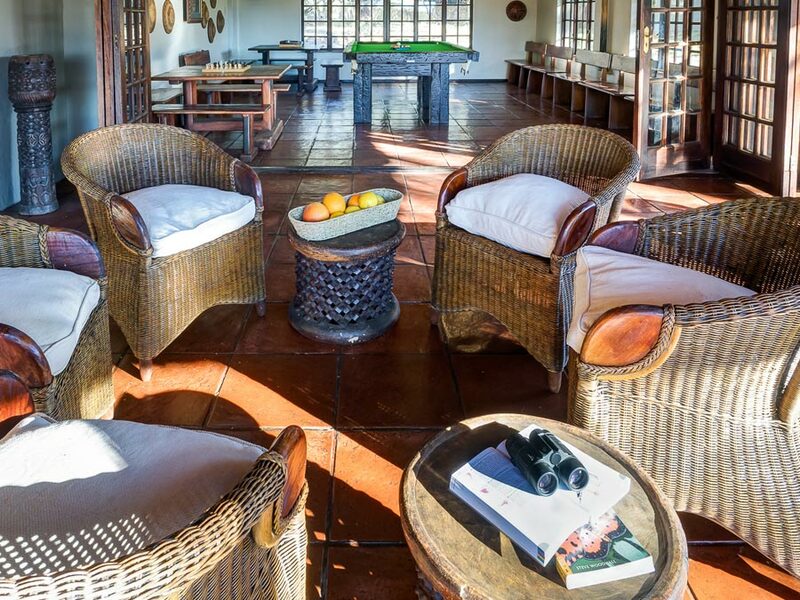 The Villa has four bedrooms, with four bathrooms and a guest toilet. 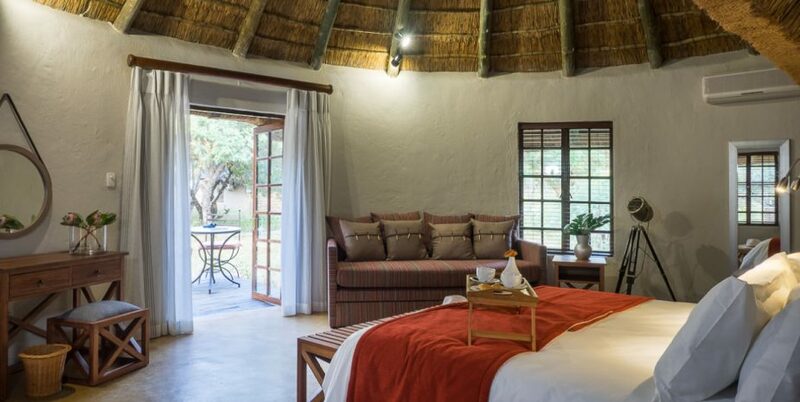 The main bedrooms have on suite bathrooms, each with a large bath, double basin, toilet and an outside shower. The two corridor bathrooms across from the second bedrooms each have a shower, basin and toilet. 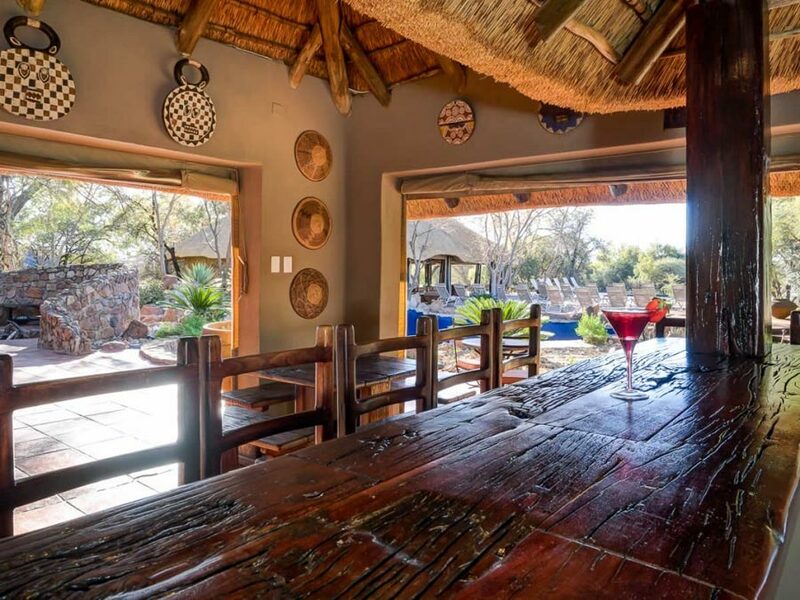 The Villa has a large open plan kitchen, lounge and dining room area which opens up onto a wooden wrap around deck. Above the lounge area there is a loft with a top deck overlooking the dam. 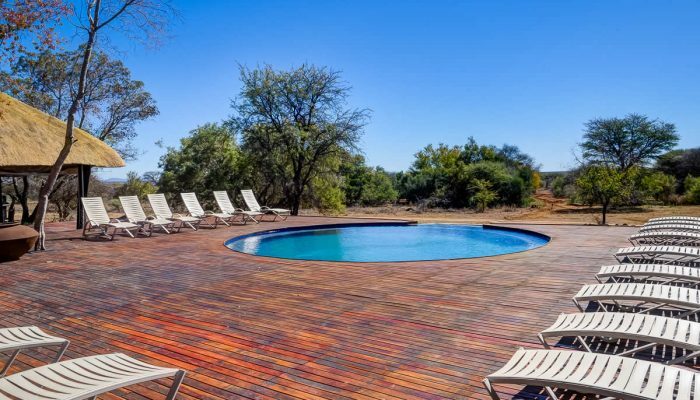 The bottom deck has a medium size pool and braai area. The Villa also has a pantry, oven , fridge / freezer combo and microwave. The Villa can accommodate 8 to 10 pax comfortably, which of 8 adults max and two kids under 12 years. 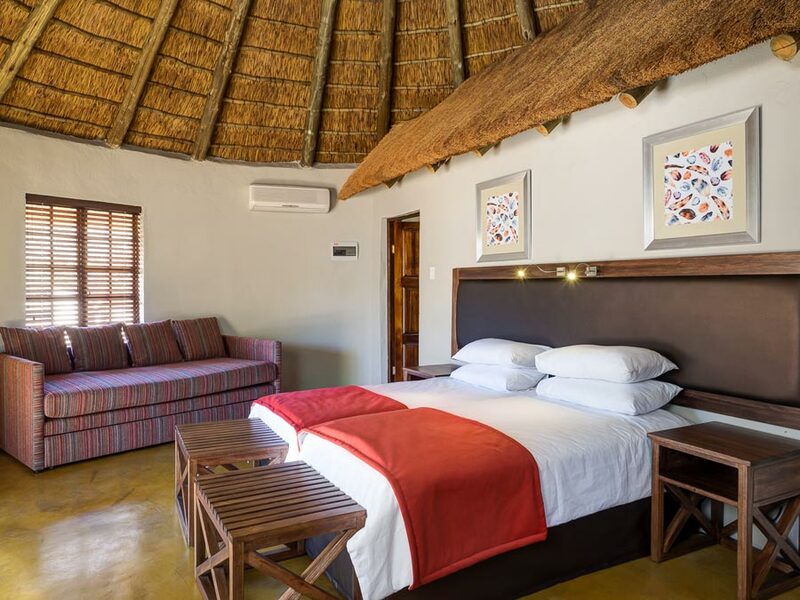 Each bedroom is furnished with a wardrobe, dresser table, small lounge area and either a king size bed or two single beds. One of the second bedrooms has two extra single beds.